The concept of "User-defined Subject" Helps the Valuation Community at large. Homequant Establishes! Often, the Valuation Entrepreneurs fail to make inroads into the Valuation business due to the high cost of the unsold population data which tends to be about 95% of the entire population. 1. Because of Homequant's discovery of the "User-defined Subject" those entrepreneurs can jump into the business now, knowing full well that the sold data alone, generally available free of cost or for a token price from the taxing jurisdictions directly, would do the trick, without having to invest a fortune in acquiring and warehousing the unsold data which, in terms of quality, is questionable at best, to begin with. 2. Additionally, unlike an institutional client, an average home buyer – in Free Home Valuation industry where Homequant is positioned – is generally interested in valuing a handful of subject properties so researching and capturing such data tend to further motivate those users. 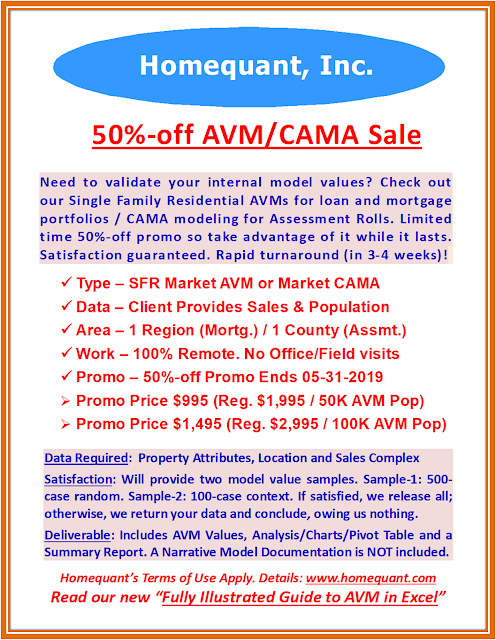 Why Homequant.com is the most accurate free home valuation system today! Homebuyers MUST Verify Appraisers' Values in Four Easy Steps. Homequant Reveals! Subject Info is often inaccurate in Public Records so verify it. For example, our subject property - a single family home - is located in N. Las Vegas, with 1,400 SF building area, 30 years old and sits on a 7,000 SF lot. Sales must be properly selected and adjusted to become comps. In this example, sales within one mile radius and 20% of the Subject's physical attributes (Land, Bldg and Age) are considered to be comps. Also, all comps are adjusted for time (sale dates) at 1% growth per month and are projected out to 12-31-2014 (a tentative purchase date). Therefore, the Subject will be valued as of that date. To converge all Comps to the Subject's physical attributes, they are adjusted at $10 per Land SF, $100 per Bldg SF and $1,000 per Year of Depreciation. If the subject is located in a pricy neighborhood, increase the adjustments as appropriate. The final five are producing the subject valuation. While the Median Adjusted Sale Price (ASP) is the most probable value for this subject, 25th to 75th Percentile range is the most probable range. Alternatively, an investor may consider up to the 25th Percentile, while someone bent on outbidding the competition to acquire the property could start above the 75th Percentile. It is therefore quite relative. In this example, the subject (a single family home) is located in North Las Vegas, with the following attributes: 20 year old and 1,400 SF of bldg area and 7,000 SF lot. Now, let's take a look at the Comps Grid to understand how to interpret the final value. While the most Probable Value is the Median Adjusted Sale Price (ASP), the 25th to 75th Percentile Range is the most Probable Value Range for a potential home buyer, although an aggressive investor might consider a lower value range, say up to the 25th Percentile, while a buyer bent on outbidding the competition might consider a more lax value range, say above the 75th Percentile. Visit the Homequant site to learn how to value a subject using optimal selection criteria and adjustments, zeroing in on the final five, as well as the value parameters.